This is another of my favourite modes of transport. Time to relax and take things at a slower pace. Great photo Martin. This evening's walk around Hartlebury. First signs of autumn colours, although it seems very early in the year for them. It breaks the composition rules, the horses should be facing into the picture, not out of it. But the sunshine was very fleeting, so I had no choice. But I'm not sure if anyone else will. Often when I show my pictures to others the response is "what did you take that for?" Fortunately the car driver had the sense to park in almost exactly the right position, and facing outwards. 6ft further to the left of the picture would have been even better, but you can't have everything. I sometimes try photoshopping such things, but it rarely works convincingly. Any more cars would have spoilt the whole thing. Sunrise 13 years ago yesterday! That is a great photo. I love the way that you have caught the horses in the mist with the foliage giving a sense of depth and perspective. There are thousands of pictures showing this view of Worcester Cathedral, taken from that side of the bridge. Just curious Martin - that last photo of the gate - it does not seem to have a purpose and the gate looks in pretty good condition. Gates are often put in first and the fence ( or wall ) is then built up to it. The gate appears to be new, it hasn't got all it's hardware in place yet. I'll bite. What are you giving up on? Those mysterious gates are quite common along public rights of way on access land. When livestock is on the land, electric fence wires are attached to them. You can see the next post in the picture. No marks for whoever made those gate posts -- they should have an angled top. With flat tops, rainwater will lie on them, enter the end-grain of the wood, and they will rot. Rob Manchester wrote: The gate appears to be new, it hasn't got all it's hardware in place yet. It's been there for a few years now Rob, along with several others on the site. The gate latch has gone missing -- either needed elsewhere, or maybe stolen. The gate was swinging open when I arrived. Judging by the long grass around it, it hasn't been used recently. Matt M. wrote: I'll bite. What are you giving up on? Taking pictures -- when I saw that one come up on the Radio Paradise slide show. I'm not going to match that, am I? I'll have a look and listen. There are less salubrious parts of Slovenia that can be photographed. 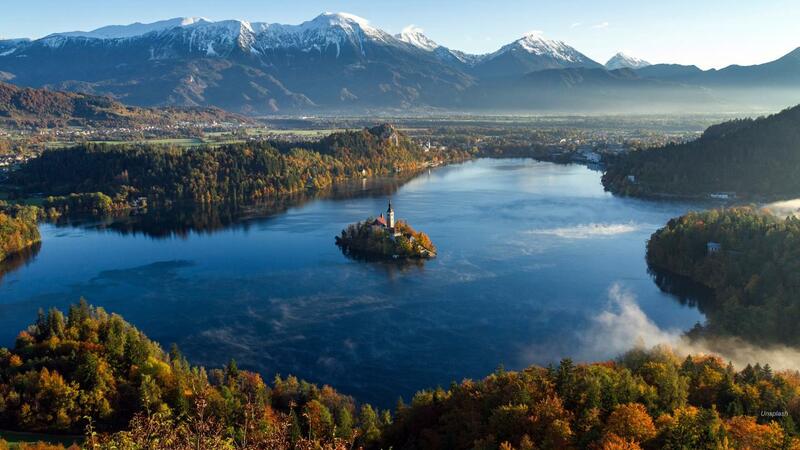 I don't think Lake Bled is a fair example of the average. madscientist wrote: is that real or photoshopped Real I think. Looks like Lake Bled. I cheated a bit. This is the view in wide-angle. I was playing with the zoom on our Nikon B700. Charles Orr wrote: Honey's off dear I wonder how many on this forum are old enough to know where that came from. This is the version I remembered. I certainly owned this vinyl LP. The sort of thing I used to get up to, all year round. No mobile phones or playstations in those days. Excellent pics. Were these film or digital? Nigel Brown wrote: Excellent pics. Were these film or digital? Thanks Nigel. Menai Bridge 2004 and Bewdley 2015 are digital. The harbour picture (Cemaes 2001) is film. This is on the approach to Galena Summit (8,700 feet) last week. Fortunately the weather was great but it can turn really nasty up there PDQ, at any time of year. That's the Sawtooth mountain range to the West. Good to see Robbie Coltrane gets around a bit in the film. Thanks for posting that, not seen it for years. A couple more in the colour reference for modelling category. Up at Cornbrook this afternoon I had my woolly hat with me, but I didn't think I would need my gloves. I was wrong. With a bit of Googling I could tell you who was playing whom, and who won. Over to you. Rob Manchester wrote: Tenbury against Stourport, The home XV is in black. The website isn't updated with the result, must still be in the pub You wouldn't have needed the gloves if you had been playing today Thanks Rob. I will give them a ring on Monday and offer my services. It's 12 months now since I acquired the X100F and I'm really pleased with it. It took me a while to grow into it -- at first I wondered what I had let myself in for and whether the difference in my photos would ever justify the cost and complexity of the X100F. Now I don't really care about that, I just enjoy using the camera so much. It has rekindled my interest in photography back to the days of using the Konica rangefinder in the 70s. I don't know now why I ever got a heavy SLR with all the extra stuff in a cumbersome bag. I thought perhaps I should update the lens cap deliberations, for any other X100F users out there. Observant readers will note that I changed from Marmalade to Blackcurrant Jam. It's very pleasing to be still using and have with me a bit of the old Konica when I'm out and about. Every time I put it on the lens the 40+ year gap falls away and I'm back in the hills with the Konica. How daft is that? I can use both these caps easily wearing gloves, which is not the case with the fiddly clip-in type of lens caps. p.s. the 49mm filter/hood ring fits the camera either way round. If you never* intend to use the clip-on lens hood, it's a good idea to reverse the ring. It is then much easier to grip 49mm filters or the 49-55mm adaptor when you need to remove them. Also, with the filter/hood ring reversed, the original X100F metal/felt lens cap fits over it very nicely (much better than onto the focus control ring as intended as supplied -- which is where I came in). *The clip-on lens hood doesn't allow a fit-over lens cap, the only option is to fiddle about inside it with a clip-in type of lens cap. Which for me makes it pretty useless for outdoor conditions, even without gloves. Should I be posting this stuff on a serious photography forum somewhere?